SEO hacking is a process of quick experimentation that aims at efficiently growing the organic traffic of web properties. Where traditional SEO strategies look at a steady growth, SEO hacking finds unconventional ways to quickly gain traction. That is a process well suited for small web properties looking to scale up organic traffic against large media outlets. In this article, we’ll see SEO hacking in action on how to steal featured snippets from large and authoritative websites! When I started blogging back in 2015, I thought I only had to produce the so-emphasized quality content to rank on Google. Quality content seems almost a utopia in the digital marketing world. Everyone talks about it, we all agree on it. Yet we all think about different things. In my mind quality content can be summarized in three simple ways: in-depth but essential, useful and well researched, educational yet actionable. In short, you don’t need to write a 2000+ words article, just because Google is thirsty for content. You need to follow the length that is congenial to the article, based on the topic you’re covering. Of course, quality content might mean – at least for me – something that is useful for an audience and well researched. Many small business owners are too busy focusing on keeping their enterprise profitable to spend time on researching SEO or other related topics. Last but not least, you want to make sure people learn something they can apply quickly. However, it doesn’t have to be dull. In short, also a “how to” can be compelling if adequately written. Long story short, when I started to write content that fit those guidelines, I didn’t get any traffic. Nothing at all! What was going on? I simply missed the proper mindset. In this article, I want to show you the SEO hacking mindset. Based on continuous experimentation, curiosity and lack of preconceived ideas of what works and what not to compete against large publishing outlets! As you can see SEO Hacking makes you think in terms of 10-100x growth. When that mindset kicks in you start thinking what strategies might be more effective to get there. This will make you neglect many other strategies that are too incremental. Let me stress one aspect though. SEO Hacking is not about shortcuts or tricks. It is instead a mindset of experimentation, quick testing, and very few assumptions. Thus, when you start executing under the SEO Hacking framework, it doesn’t mean you will achieve great results with no effort. This would be the wrong message. It takes a lot of effort to execute under a 10-100x growth framework. However, this effort isn’t far from the effort of someone that thinks incrementally. But the primary difference is that the SEO Hacker will not believe in what others say until it will be tested. It all starts from a mindset of quick experimentation. You often need to ask the right questions. If you ask yourself “how do I improve my traffic by 10% this month?” chances are you will look for the wrong answers and solutions. Indeed, you’ll probably find hundreds of articles about that on the web. None of it will help you go far. Instead, if you’ll ask yourself “how do I improve my traffic by 100% by next month?” this will change it all. All of a sudden you’ll probably find a couple of worthy articles on the web about that. Yet even those article won’t help you much. Suddenly you will need to think for yourself. How do I get there? You will draw a list of ideas, and you’ll need to test them up. Therefore, you’ll start from the growth mindset, elaborate a strategy, and after seeing that work over and over again, have a framework. It is important to remember that frameworks work by time to time, and the more they get implemented by others (so the more they become a “best practice”) the less impact they will have. This doesn’t mean best practices don’t matter. But only that they won’t be enough to generate 10x growth. To create that kind of impact you will need to go into the uncharted waters and be willing to experiment. Keep what works: Once you identified what’s working and creating an impact, or has the potential of generating it, you’ll need to double down! Execute at high speed: When things start to work out, you will need to speed up the execution, move fast, to make sure to gain as much traction as possible from these ideas that worked. You’ll need to do that because the framework you came up with won’t work forever. And if you figured it you will need to push it thourhg with maximum speed and determination, no looking back! Once you get there, you’ll need to reiterate the process, over and over again. A few weeks back in one of our daily conversations with Andrea Volpini, WordLift’s CEO, we were discussing a few SEO strategies. With Andrea, we often discuss at great length about SEO, the future of the internet and how search engines, Google, in particular, react to that. Our conversations are a way to brainstorm ideas. That day we were walking through Via Giulia, an old street in the historic center of Rome; a road that runs parallel to the Tiber River. One of the most famous streets in Rome during the Renaissance, Via Giulia became the home of antique dealers in the past decades. Yet today due to the crisis of antique trade, the street has become the home of modern shops. Among those shops there is WordLift. A small startup that operates at the cutting edge of semantic technologies applied to the web. That is where I work as a Head Of Business Development. When we walk through Via Giulia, a feeling of being part of something greater permeates us, and it feels like you go back to the past, when Rome was the most powerful Empire ever existed. These feelings make ideas flow incessantly. In that scenario, Andrea had just revealed to me a secret about Google. I’ll summarize in this way: images have their own life in Google’s SERP, and if you take the time to produce original images and redirect them to your blog. That can become an effective SEO strategy to bring traffic back to your site. It all started from there. When I heard that I began to run a few experiments. This strategy is beginning to pay off. In this featured snippet on the keyword “cash conversion cycle” with a volume of 18,100 Google is picking the content from Investopedia and the image from my blog. You’ll notice that the image redirects back to my blog. In this article, I show you what I did and how you can do it too. Many think of an editorial strategy as a calendar filled up with articles for the next year. That is not the way I see it. An editorial strategy for me is about having clear in mind what are the 2-3 topics you want to cover at great length. Based on that you need to be flexible, and opportunist. In short, you want to keep an eye open for opportunity windows that allow you to rank on large volume keywords. Long story short I’ve implemented an editorial strategy on FourWeekMBA.com by creating content that targeted specific keywords around business modeling. Yet those articles would hardly rank for those keywords as I was competing against large websites like Investopedia. I didn’t want to change my editorial strategy. In fact, I’m passionate about business modeling, and I know I can keep researching this topic for years. Also, that is a topic with a broad audience. Thus, I had the two conditions I believe are critical to building a profitable website. I also needed a secret recipe to start ranking on those keywords though. I began creating companion infographics with my articles, which had the size of a LinkedIn post. The aim was to provide a snapshot of the business, quickly. Those graphics would target the same keywords in the article. In this analysis by SparkToro in collaboration with jumpshot one thing is straightforward: images play a key role in Google search results. In other words, Google is integrating more and more images in the search results, thus making them part of the user experience. Therefore, you should be not surprised to see your pictures floating around the web, disjoined from your content and inserted in other contexts. In fact, more and more often, images appear in the so-called featured snippets. Other times they are included in the knowledge panels. That opens up an exciting opportunity: having original images might be a critical strategy to power up your SEO strategy. And I want to show you how to use them to gain featured snippets on very competitive keywords. However that also opens up another challenge: as Google is thirsty for relevant content, be it text, image or video, it will happen more often than these contents will be stripped out from the context of your website to get offered in different formats. From search results, featured snippets, knowledge panels, or voice assistants. It doesn’t matter how Google will serve that content; it will be Google to make the rules of the game unless you make sure to follow two strategies. Number one, bring all the traffic generated through those graphics or infographics toward the original blog post that features them with a simple redirection. We’ll see those two aspects more in detail in a few paragraphs. One thing you might have noticed though is that this featured snippet only comprises text. There is no image in it. Why? One possible reason might be that Google didn’t find relevant images to include in those featured snippets. In short, even though Wikipedia is a trusted source of information, it doesn’t seem to provide original, and valuable images that Google can use within the featured snippet. That is where the opportunity to get in that featured snippet comes in! Let’s go back to our case study and what I did to get there. When I was looking for featured snippet opportunities, I had identified a long-tail keyword with a large volume: amazon cash conversion. That is where I could have an opportunity even though there was no way Google would have taken my content in place of Investopedia. So I wrote the piece and worked on an original “companion” infographic. There are a few aspects you will notice. The infographic is informative, it is quick, and it is branded. I also picked a color that resembled The Economist infographics. Thus, making it more trusted at first glance (at least for people that know The Economist). Structured data is about converting your content in a format that search engines can efficiently process. In other words, to make your content more sticky for the Google algorithms, structured data has become a must. WordLift passes up a set of metadata to search engines that describe the context of the page. That also includes relevant information about the infographic featured in the article! As I use WordPress as CMS, I used a simple plugin to have traffic redirected from the image – in case it ranked through Google – to the original blog post it belonged. In short, when you have a website, you have a list of pages that you can prioritize based on a so-called sitemap. Put it shortly; the sitemap is the way you want Google and other search engines to look at your website. That doesn’t mean Google will stick to it, but that is an indication that helps it understands a website. Within the sitemap, you need to have also your images. In this way, you allow Google to more easily index, thus rank them (again Google will decide whether or not it makes sense, yet you give it an indication). For that, I use a simple plugin, XML Sitemap Generator for WordPress. Exactly, back to my blog post! Another critical aspect of your infographic is about generating search volume for your branded keyword. A branded keyword is merely a keyword that represents your brand. For instance, in my case, that would be FourWeekMba, or four-week-mba and other possible variations. Why is that important? A branded keyword is significant for several reasons. First, gaining search volume on a branded keyword might tell Google that your brand/website is relevant. Second, when you build up volume over time, you also start diversifying your marketing mix. Thus, you’ll notice more direct traffic to your blog. That’s good as you don’t need to rely solely on Google for a consistent stream of traffic. For the sake of simplicity, I’m just showing you the main branded keyword. In fact, in my search console, I have other variations (like fourweekmba). What’s interesting here is that on this branded keyword the click-through rate is pretty high (47,83%). In fact, the click-through rate shows how many times, based on the number of impressions from the search results, the user clicks on my page. That is critical as that points to Google that this is what the user was looking for. Thus, that – in theory – should make my website more trusted (this is wholly speculative). There is also another aspect that is critical for this story. I published the article on February 26th, 2018 and for a while I just let it rank organically. In short, after about three months I managed to gain a half featured snippet with an image with my small blog by competing with Investopedia, one of the largest and most trusted sites when it comes to business. If you’ll be implementing a strategy based on positioning your images on the featured snippet, how can you make sure you’re doing it right? In this way, you can track your marketing effort in gaining organic traffic via original infographics. As search engines evolve new opportunities arise. Thus, by keeping an open eye, you can take advantage of those opportunities even if you have a small blog. be patient and wait for it to be positioned in the featured snippet. SEO is not a short-term game! One key aspect to keep in mind. SEO hacking is not about finding the latest trick to win some traffic. 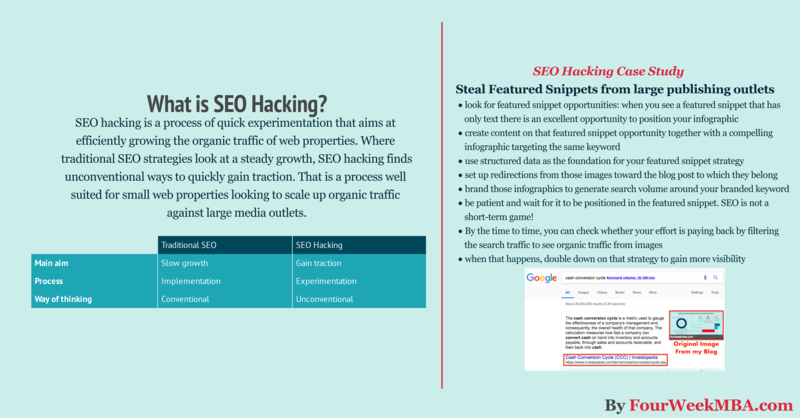 SEO hacking is a mindset – that mixed with limited resources, experimentation, and creativity – allows you to gain traction even on competitive terms. You just need to think unconventionally and experiment quickly. When you shift your mindset and start targeting featured snippets, interesting things can happen. Indeed, this is even more interesting than the featured snippet itself. In fact, in the featured snippet the image is too small for users to click on. Yet on the voice search assistant on your smartphone, the opposite happens. The infographic “eats up” the text coming from Wikipedia! In fact, not only the image seems part of Wikipedia (Google is tricking you) but when you tap on it you land on my blog!